Lotus Rock | What is Lotus Rock? The Lotus Plant is a symbol of purity in many Asian religions due to its supreme self-cleaning ability. Although the surface of the plant looks smooth it is in fact very rough and is covered in micro-lumps and bumps of protruding epidermal cells, which in turn are covered by wax crystals. These wax crystals are hydrophobic (water hating), this means that the water only makes contact with the leaf at the top of the lumps. This forces the water into spherical droplets (as the picture below shows). Even at a slight angle these droplets roll and tumble taking dirt particles along with it, this self-cleaning process is called the Lotus Effect. Using the same technique Lotus Rock has developed its own patented coating technology, which can be applied on cookware and bake ware surfaces. Sauces or other liquids that are added during the cooking process cannot permeate the lotus leaf-like surface. A thin layer of silicone-oxide acts like the wax crystals above and excludes these substances from entering the surface of the cookware. This self-cleaning ability (the Lotus Effect) helps the consumer clean their cookware both more easily and effectively. 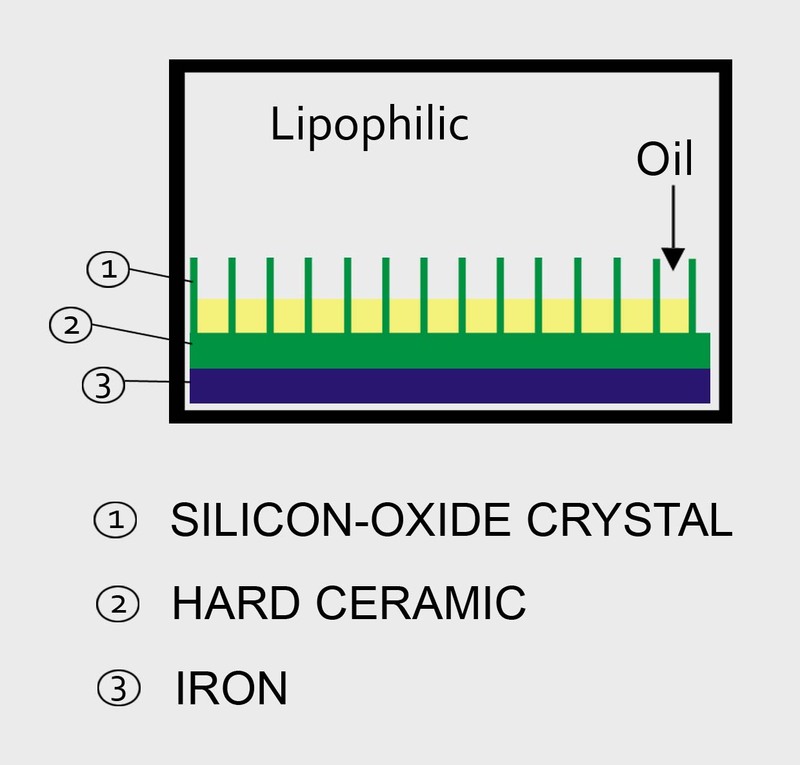 Additionally, the thin layer of silicon-oxide crystal, which rests upon the hard ceramic surface, has a second quality: it is not just hydrophobic (water hating), it is also lipophilic, which means it is permeable to cooking oil. At the beginning of the cooking process the consumer must add cooking oil which then infiltrates the surface of the cookware. This means that in contrast to water, which sits above the wax crystals, the cooking oil is able to rest alongside, and in between the crystals. Always adding oil before cooking creates a physical non-stick surface, perfect for a high-quality cooking experience. 1) Lotus Rock’s surface is a specially configured design which has very high heat resistance. Most general non-stick cookware, which is organic-bonded, can easily break under a high temperature. This can, consequently, create a harmful chemical smoke which is bad on environmental and health grounds. In contrast the Lotus Rock silicon-oxide coating is made up of inorganic substances: it is in the form of a thin crystal, which has no traces of carbon within it. Conversely, the type of ceramic material that the silicon-oxide coating rests on can resist temperatures of up to 350 degrees centigrade, which is particularly advantageous for frequent, intensive cooking. 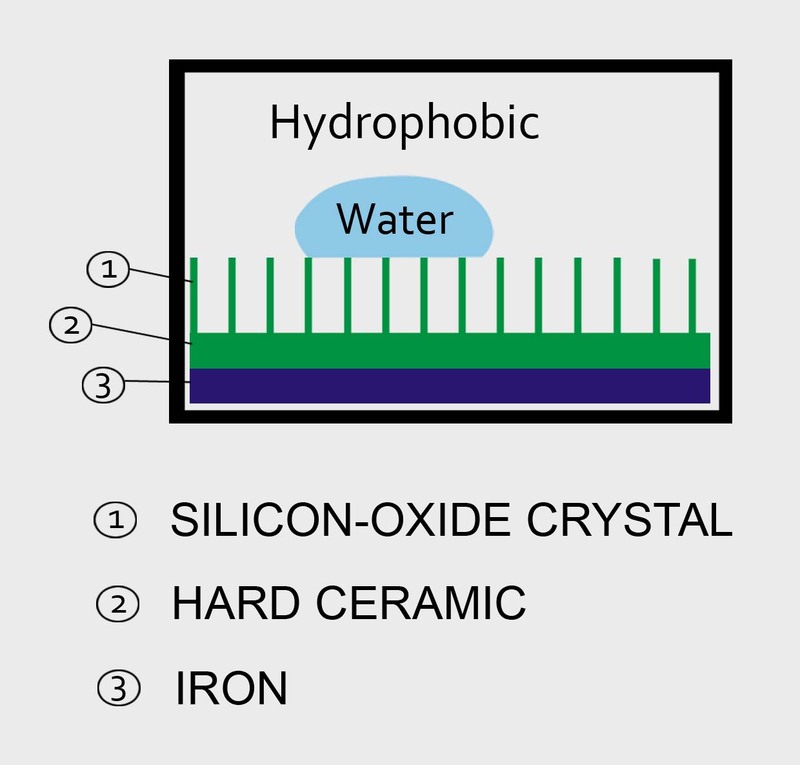 2) The layer of silicon-oxide crystal that rests on top of it is extremely thin. Even with modern day utensils humans are not able to peel off the material. This makes the surface between the silicon-oxide crystal and ceramic very compact and difficult to scratch. Furthermore, it means that, unlike most cookware, the Lotus Rock is metal utensil safe, making it very convenient to use in a busy kitchen. Because of its high heat resistance, self-cleaning ability and supreme hardness, Lotus Rock is a product that can be used happily for many years. Lotus Rock is a strong, long life and environmentally friendly product. Why is Lotus Rock an environmentally friendly product? - It is PTFE/PFOA free! It never produces TFA (Trifluoracetic acid), which is harmful to people’s health and to the climate. - The carbon steel is made with a heavy gauge, giving it a strong construction for long term use. - Quick heat absorption and good energy retention; saving energy and reducing CO2 emissions. - Natural easy clean construction made without PTFE & PFOA. - High heat resistance, no chemical smoke or smell during the cooking process. - Rock-hard quality means it is metal utensil safe, allowing frequent usage. - Environmentally friendly, has efficient energy use. - Non-reactive surface for hassle-free cooking. - Quick heat absorption creates an amazing cooking result; retains high vitamin content and maintains a delicious taste. - Magnetic material is compatible for use on induction hob. - Good corrosion resistance, rustproof.
. I am extremely disappointed by this pan (Echo 22 cm non-stick Exdura Lotus Rock). I cooked 1 egg in it and there were no non-stick properties what-so-ever. I immediately threw it in the garbage. I selected this because I could use metal utensils, it had a weight that other similar pans did not have and I expected it to be a wonderful non-stick surface to use in my daily cooking. This was not the case at all.
. I just came back to read the reply to my comment and it’s gone. I remembered that I never heard back because I just burnt the ceramic coating pan to a crisp and I believe I have ruined it. My initial concern was the nano technology. It being so small that it can get into our bodies super easily, and will we find out in the near future that it does as much or more damage than teflon? I have noticed, due to my pan burning, that when washing it (and almost everything came off, but it’s discolored), the blackness filled in scratch marks. (I have been babying this thing, so there shouldn’t be scratch marks)… which means that the nanotechnology ends up in your food. The scratch marks were so fine that you couldn’t see them really before the blackening. Please respond.
. Dear Bela, thank you for your enquiry with us (and we apologise for our late reply). Please note that nano-technology is only used in Lotus Rock during the production stage, and when the silicon-oxide crystal is coated on the pan it is no longer at a nano particle size, it is larger than that. Regarding your comment about the pan ‘burning’ perhaps you should read here to resolve that. When you write ‘almost everything came off’, I think the more likely explanation is that a lot of ingredients from cooking got burned on your pan and formed a layer on top, and that it was this that came off during washing. For the ‘discoloring’ issue you should read here to deal with that. Regarding ths blackness, this sounds like scratch marks from over-heating, so I would recommend that you re-purify the pan, as described here. Lastly, about the scratch marks – Lotus Rock has among the best abrasion and scratch resistance for a coated pan in the market place. Have you tried rubbing the scratch mark to see if you can remove it that way? Even if the scratch marks remain this should not impair the quality of the Lotus Rock pan. .Hi again, I do have another concern to get confirmed. In the section of this website called: “Lotus Rock is Induction Safe” it says that this cookware (IPAC Exdura Lotus Rock) is safe for all surfaces. The pan is a gift for my Dad who has a very expensive ceramic cook top in his kitchen. Is there any possibility that this pan will scratch this surface? What cautions do you recommend when the pan slides around on the ceramic cook top’s surface? Thanks…again for your assistance!
. Dear Scott, from our own experience we have never encountered any comments from customers that a Lotus Rock pan has scratched the surface of a ceramic cooking top. Just be mindful that a Lotus Rock pan is fairly heavy compared to the aluminum pans that your dad has used previously, so handle them with care when transferring to and from the cooking top surface.
. Hi.. I purchased the 12 in. IPAC Lotus Rock (Echo brand) pan from Marshall’s in Ft. Worth, TX mainly because of the heavy, sturdy feel of the pan, compared to the non-stick properties. My Dad has several aluminum and ceramic coated pans that have all warped their bases over time and use, as they’re all the thin types. Then, I read a note at the very end of “Lotus Rock & Pre-Heating” on this website that you must be careful and pre-heat this pan because even though it is thick and made of carbon steel, it’s still susceptible to warping as well. I don’t want another warped pan, so is it necessary to start out in Low, progress to medium heat after a few minutes then go on to high heat if the recipe calls for it? Can you elaborate that due to the materials used and the fact that this pan is much more thick than most, that it will take a lot more abuse to warp it? Thanks so much!
. Dear Scott, thanks for enquiry with us, you have asked a very pertinent and relevant question about Lotus Rock cookware. One of the most important differences between Lotus Rock and general ceramic/ non-stick coated pans is heat conduction. A Lotus Rock pan heats up very quickly, so it must always be on a low-medium heat setting. However, there is also another important difference between Lotus Rock and general ceramic coated pans and that is its high heat storage capacity. Similar to cast iron, the heavy gauge carbon steel, along with the thick ceramic surface of a Lotus Rock can hold a lot of heat, so although you will using a lower heat source with a Lotus Rock pan, you will in fact be holding onto more of that heat in the pan as compared to a pan made of aluminium. This is perfect for searing meat and vegetables to impart a delicious brown, tasty crust. As long as you always keep the pan on a low heat, it should not warp. I bought echo pan and used it for the first time was great. The second day I used it , I followed everything and my fish burned and the debris won’t get off. .Dear Christie, thank you for your question regarding the Echo Lotus Rock frying pan. Please bear in mind that Lotus Rock pans do heat up much faster than either aluminum or stainless steel pans, so a lower heat setting must always be used. Generally it s best to always heat a Lotus Rock pan on a low heat and let the heat build up inside the pan, please read here for more information. Please also note that pan-frying fish is, because of its flaky skin and high protein content, a difficult type of food to cook at the best of times. However, if you get it right then using a Lotus Rock pan can give you a well-done fish with a tasty caramelized crust on the skin. Regarding the burnt marks, I suggest you follow the information here to remove it and replenish the non-stick release on the pan. If you have any further questions please don’t hesitate to contact us.
. Is the Exdura Green II coating the same thing as lotus rock? I bought a frying pan at TJMaxx branded IPAC with this nonstick coating. Thanks. Thank you for your enquiry with us. Actually Exdura Green II is also produced by our parent company but it is very different to Lotus Rock. Exdura Green II is a sol-gel technology ceramic coating, similar to other pans such as Greenpan or Thermolon. Lotus Rock on the other hand is very differnt to this, as explained on this very page and on the blog posts on this website. If you have any further questions then please don’t hesitate to contact us.
. Are the frying pans and handles oven safe? Thank you for your enquiry with us. The frying pans are all oven safe, but for oven safe handles you must either choose from our Professional/ Forged collection or the Sydney silicone grip handle from the Soft grip collection.
. bought the 7 inch frypan badged ipac at home goods. loving it so far. like the weight of the pan, good solid feel. do have to watch the heat as fried egg does start to stick if too hot. quick shake frees them though. easy clean up too. Where in Michigan is it sold? The Lotus Rock frying pan is sold in TJMaxx stores under the Echo brand. Thank you for your review of the Lotus Rock frying pan. You are right on all three points you make about the quality of Lotus Rock. It does indeed cook evenly (but also quickly), and this is because of the heavy gauge steel substrate, with a thick ceramic interior on top of that. One of the significant advantages of Lotus Rock compared to other pans is its easy-to-clean ability http://lotusrock.com/why-is-a-lotus-rock-pan-so-easy-to-clean/ , with a similar function to that of the Lotus Effect. Lastly, it does indeed have a solid feel, steel is 3 times denser than aluminum, and the thick gauge of Lotus Rock pans ensures that they will, as long as they are well maintained, last a long time. Is there fluoride anywhere in the coatings?
. Is nanosilica actually a nanotechnology? I have been hearing that there are safety concerns about nanotechnologies used with food preparation and personal care products.
. Dear Michael, thank you for your comment above. The Lotus Rock nano-silica coating has been tested extensively according to FDA, LFGB and EEC testing standards. Both the pans and the coating itself have testing certificates from these agencies to prove they are food safe. If you require any further information about this or anything else regarding Lotus Rock pans then please do contact us.
. Is there any down side, besides being a heavy utensil. ?
. Dear George, please note that I have replied directly to your email address regarding the question you have asked above.